Riot Games has overhauled champion Sejuani's appearance to help her look more like a warrior. Generally speaking, if you're a female character in a videogame there's a fair chance you'll be sexualized at some point in the experience. This isn't always the case, of course, but there never seems to be a shortage of developers happy to fashion women with a seeming inability to dress appropriately for the environment, circumstances, or war they're dealing with. If you're a man in a fantasy game you can count on entering battle with nothing short of the thickest, finest plate armor. Women, on the other hand, are given bikinis, thongs and other bits of flesh exposing armor clearly not intended for protection. Apparently recognizing the stupidity behind this, Riot Games is taking the rare step of giving a female character more clothes. The developer has revealed that Sejuani, a champion character in League of Legends, will soon be sporting a new outfit designed to more accurately represent her role as a warrior. "Sejuani's lightly-armored, skin-flaunting, fleshy apparel didn't mesh with the idea of a dominating, ice warrior," said League of Legends in a blog post. "Now heavily armored atop Bristle, this visual rework clearly conveys the core of our concept for the champion. She's powerful, capable of conquering the Freljord and leading the Winter's Claw to victory." This isn't the first example in recent years of game companies trying to decrease the rampant sexualization of female characters. The recent Tomb Raider reboot famously reduced Lara Croft's bust size to something human, as well as giving her clothes that were a bit more practical for adventuring than the tight shirts and hot pants that had been one of the character's trademarks. 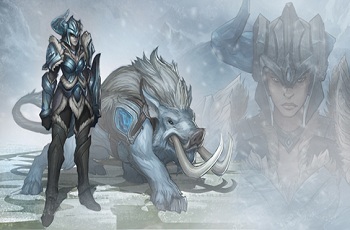 In Sejuani's case, she'll trade a scant outfit for heavy armor that certainly makes a bit more sense for a winter warrior.